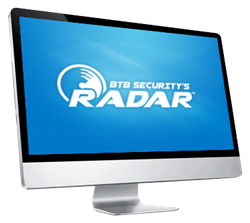 BTB Security, a leading information-security assessment, detection, and incident-response firm, today announced the availability of RADAR v2.0 managed detection and response service, which offers greater visibility for security monitoring of cyber-attacks. Updated User Interface (UI). The new, interactive dashboards graphically make implementation, customization, and automation easier. Enhanced Machine Learning. Advanced learning is based on the work of our virtual information security analysts. Workflow Automation. Learning functions determine the best response based on severity of the breach. Version 2.0 also includes enhancements to other RADAR features, including Application Security On-Demand, Integrated Vulnerability Management, and Active Response capabilities. Version 2.0 and the full capabilities of RADAR are accessible for evaluation by requesting a personal demonstration with an information security consultant. BTB Security’s RADAR is a managed detection and response (MDR) service that provides actionable threat intelligence with no infrastructure to buy. It combines advanced monitoring and detection technology with skilled expertise to accelerate detection, manage incident response, eliminate blind spots, and reduce false positives. RADAR supports clients valued over $26 billion across all industries at top companies in North America. BTB Security helps organizations worldwide detect, defend and defeat security breaches. From ethical hacking and vulnerability assessments to comprehensive managed security services programs, incident response and forensic analysis, our solutions are designed to provide comprehensive security to organizations of all sizes. For more information, visit http://www.btbsecurity.com and follow us on Twitter, LinkedIn, and Facebook.